Laurel and Hardy were there early on. 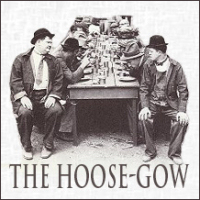 Hoosegow is now the standard spelling, though in its early days it was written half a dozen different ways. We link it in our minds with cowboys largely because so much of their lingo was taken from Spanish and then mangled to fit English ideas of the way to say it. That included buckaroo (Spanish vaquero), bronco (from a word that meant rough or rude), lasso (lazo), lariat (la reata), chaps (chaparreras), hackamore bridles (jáquima), mustang (mesteña), cinch (cincha), as well as the direct borrowings of corral and rodeo.